Another eye eyeshadow little palette for you. I had this Faces Go Chic Eye shadow Time Wined quad but every time I will forget to review it and I have used it twice and both for the night time eye makeup. 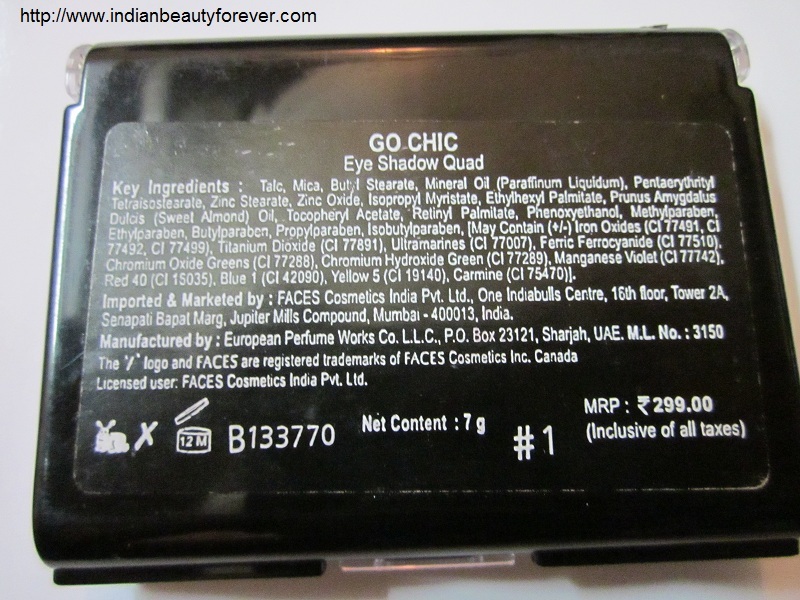 This is the cheapest and most affordable eye shadow quad I came across though not the best. Ingredients: Given on the packaging image below. 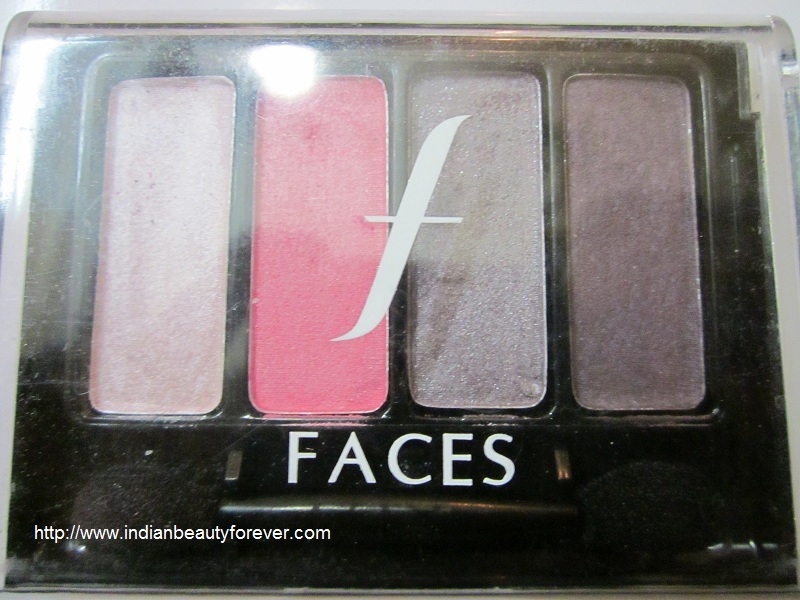 Experience: This eyeshadow quad or palette comes in a sturdy transparent top packaging. 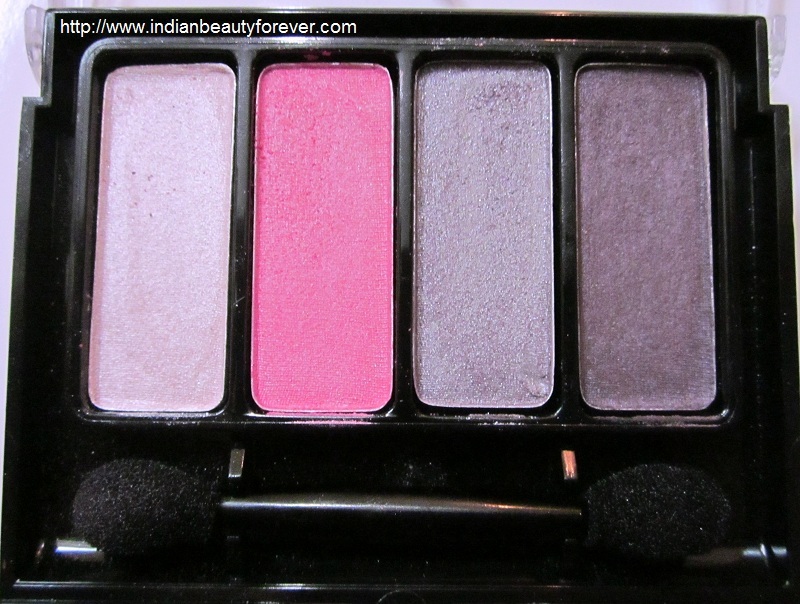 It had four eye shadows: very light peachy color, pink, mauvey grey and a deep purple. It comes with a dual end sponge tip eye shadow applicator phew that was long! !which I have not used it.. I did swipe the applicator across the shadow and try to apply the shadow on the back of my hand but these sponge applicators do not allow even finish and transfer less product too. Most of the pigment will get trapped in the sponge itself due to which it comes as a patchy finish. I would say, this eye shadow palette would be great for those of us, who are looking for an affordable but quality palette with soft, subtle and everyday kind of colors!! But honestly, the palette was not as per my liking except for the deep purple color moreover the texture of the shadows is powdery as I mentioned earlier. I wonder why they put light shades in the palettes. I am sure most of you would agree with me, that light shades can wash out majority of Indian skin tones and warm shades can look beautiful at the same time. What do you think?? 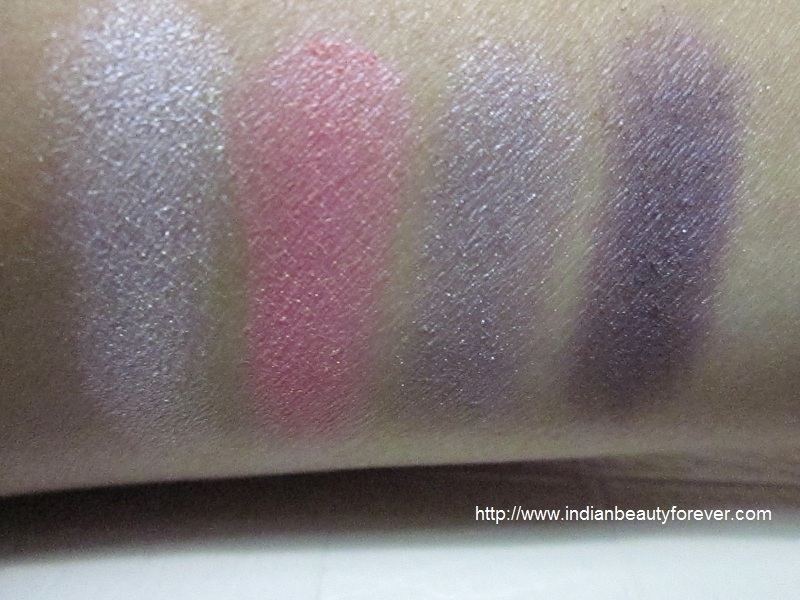 These are the swatches and you can yourself judge their pigmentation and the small eye makeup pic. 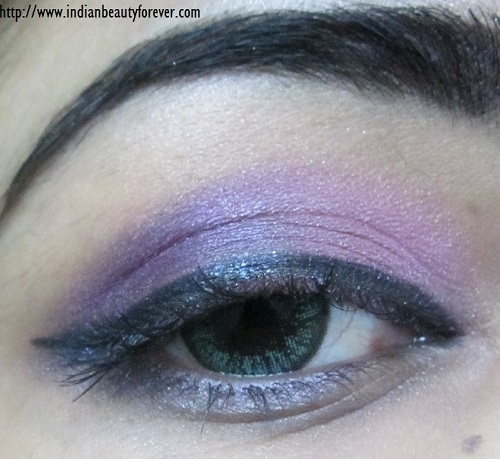 :D where I have used the last two shades! Time to sum up the pros and cons. Easily available online and Faces Canada counters. Key ingredients mentioned on the packaging itself. Soft colors for everyday wear and appropriate for those of us who would like to go for subtle colors. Low on staying power, I guess due to its powdery texture. Average pigmentation though that can be intensified with primers. Final words: I would not say that for the price it’s a bad product but I wish the colors could have been a bit more pigmented. 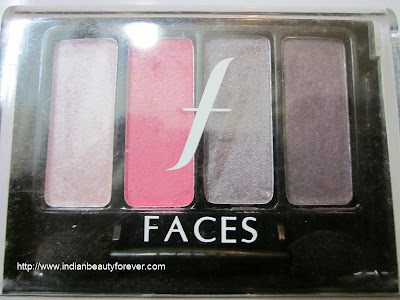 If you are a beginner looking for an affordable palette with soft subtle shades that you can wear daily then you may consider it. Others shades are also available. even i think pigmentation could have been a little better. Great review & EOTD Niesha.....I would definitely try the trick you have mentioned! Hope you like the trick. Beautiful EOTD Niesha..I have one of these too.. forgotten the name but its quite ok for the price.. Thank you Parul :), i agree they are okay for the price and the beginners. I think there might be inconsistency in the quality. My taupe mauve palette even beats the Revlon ones. But when I swatched this one at the counter, I just hated it. Thats what even i think. Its not just this brand u have seen this quality change in other brands as well. which is not good when you buy a different shade getting impressed with the first one. Try some eye looks and post them soon.. its always fun to see EOTDs. Its average product for the price. Love ur eye look. But this palette seems very okayish quality wise. Thank you Dollie.. its just average nothing great.